A special request was made on Twitter for this specific article after a North Carolina student read an article on ESPN that was based off of this article. To see that article by my friend and mentor Dr. Richard Lapchick please click HERE. Though Smith had 879 victories to speak of when he stepped down in October of 1997, perhaps his greatest victories were the ones that were not tallied. Perhaps his utmost wins came off of the court. Recruiting Charlie Scott, fighting for racial equality in North Carolina, and having the courage as a young man to ask his high school principal to desegregate the school’s basketball teams in spite of societal norms are much more significant than what a scoreboard read at the end of a basketball game. Dean Smith saw through the lies that Topeka High School and society were telling him and knew Topeka High School needed to be unified. 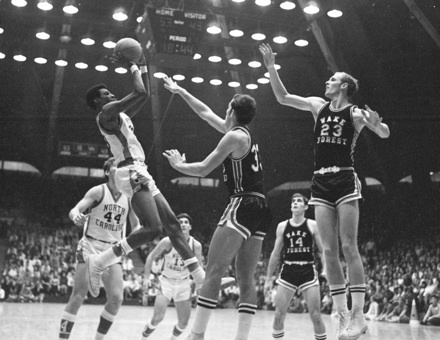 He knew that in order to win, on and off the court, that the teams could no longer be divided on the basis of race. In 1954, Chief Justice Earl Warren would tell the Topeka Board of Education that Plessy vs. Ferguson no longer applied to public schools. He would explain to them that a young girl should not have to ride a bus to an all-black school when she can walk the seven blocks to a school that had been all-white. He would explain that separate is never equal.5 Brown v. Board helped to dispel one of the greatest lies American society has ever told. In 1858, President Abraham Lincoln declared that, “A house divided against itself cannot stand.”12 A high school cannot have two separate varsity teams divided on the basis of race and consider themselves an integrated high school. A school cannot neglect to claim one team and force them to play and practice with less equipment and in a separate facility and call it equal. One team cannot eat in restaurants on the road while the other is eating rabbit in churches. Yet from 1871 – 1949, Topeka High School did just that and claimed to be integrated when that really was not the case. The Ramblers and Trojans were both conditioned to believe that exclusion and disconnection were in the best interest of all parties involved and that both were given equal opportunities. 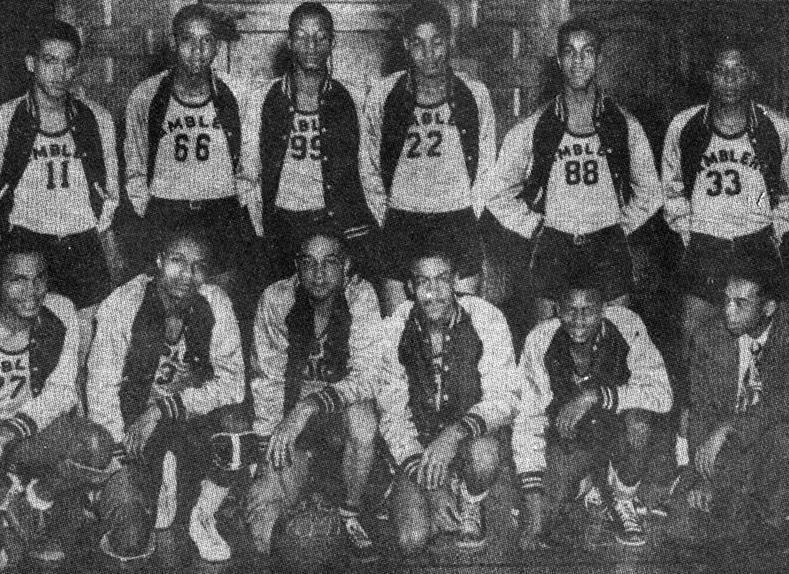 Topeka High School had two talented basketball teams but to ensure “equality” kept them apart. If only Topeka High School had one team instead of two, the great teams that could have been. If only. If only the Trojans and Ramblers had been allowed to play as one, united; Topeka High School could have multiple championships to their name. But unfortunately, they were forced to play as two, divided. In the name of societal interest they fell divided, with only tradition and “best interest” to blame. 1 Mike Adams, “A Microcosm in Basketball”, The Baltimore Sun, January 6, 2002, http://articles.baltimoresun.com/2002-01-06/news/0201060203_1_topeka-jack-alexander-blacks-and-whites. 2 Steve Fry, “’49 Basketball Teams Segregated”, The Topeka Capital-Journal, October 10, 2009, http://cjonline.com/news/local/2009-10-10/49_basketball_teams_segregated. 3 Lisa Cozzens, “Brown v. Board of Education”, African American History, May 25, 1998, http://www.watson.org/~lisa/blackhistory/early-civilrights/brown.html. 4 George C. Wallace, “1963 Inaugural Address”, January 14, 1963. 5 “Brown vs. the Board of Education of Topeka Information Release”, The Topeka Capital-Journal, February 28, 2002, http://cjonline.com/stories/022802/ksb_release.shtml. 6 Topeka Public Schools, “Famous Topeka Athletes: Black Pioneers Slam-Dunk Segregation!”, Sports Gazette, Accessed June 7, 2010, http://www.hummersportspark.com/index.php?option=com_content&task=view&id=41&Itemid=46&limit=1&limitstart=7. 7 Topeka and Shawnee County Public Library, “In the Paint”, Accessed June 8, 2010, http://www.tscpl.org/programs/comments/in_the_paint/. 8 Mississippi Blues Commission, “Club Ebony,” Accessed June 10, 2010, http://www.msbluestrail.org/_webapp_2179154/Club_Ebony. 9 Steve Fry, “Ramblers, Trojans Talk Basketball”, The Topeka Capital-Journal, October 15, 2009, http://cjonline.com/news/local/2009-10-15/ramblers_trojans_talk_basketball. 10 Phil Ponce and John Feinstein, “End of an Era”, Newshour, Public Broadcasting Service (PBS), October 9, 1997, http://www.pbs.org/newshour/bb/sports/july-dec97/dean_10-9.html. 11 Elizabeth Hull, “Black History at UNC: Charles Scott”, UNC Library, February 6, 2009, http://www.lib.unc.edu/blogs/morton/index.php/2009/02/black-history-at-unc-charles-scott/. 12 Abraham Lincoln, “House Divided Speech”, June 16,1858. This entry was posted in Attic Corner and tagged Basketball, Black History Month, Brown vs. Board of Education, Charles Scott, Dean Smith, Devan Dignan, Emporia State University, Oliver Brown, Topeka Ramblers, UNC. Bookmark the permalink.